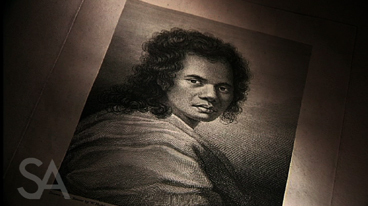 Video clip synopsis – Omai, a young Tahitian warrior who joined Captain James Cook’s second voyage, had his portrait painted by Sir Joshua Reynolds and inspired a spectacular pantomime at Covent Garden. Broadband MP4 seaislander_bb.mp4 (19.1MB), suitable for iPods and computer downloads. P10 communicates information, ideas and issues using appropriate written, oral and graphic forms. The key concepts to be integrated across The Social and Cultural World such as: Socialisation, Acculturation, Change, Continuity, Micro World and so forth – fit well with this study. A young Tahitian warrior named Omai enlisted as a crew member during Captain James Cook’s second circumnavigation of the world. On his arrival in London in 1774 he was welcomed into the highest social circles. England’s most sought-after 18th century painter, Sir Joshua Reynolds, painted his portrait in 1774, for which a rare sketch is held in the National Library collection. While Omai eventually returned to the islands, his story inspired a spectacular pantomime at Theatre Royal in Covent Garden. With costumes designed by Philippe Jacques de Loutherbourg, the pantomime brought ethnographic realism to a somewhat farcical plot. The visit of Omai was a sensation in late 18th century Britain. Why would a visit by a person from another place arouse such interest? Can you suggest a comparable visit or visitor that might cause a similar sensation in our society today? An idea that was current during the time was that of the ‘Noble Savage’—people who were deeply in touch with nature, and who lived rich, fulfilling but perfectly natural lives. How might Omai have seemed to be an example of this idea? The ‘Noble Savage’ idea in fact did not take into account the complexity of the society that Omai had come from. What elements of this complexity can we see from this segment? Was Omai exploited or did he exploit the situation? Explain the reasons for your answer. Omai can be seen as representing some of the benefits and problems that came with culture contact between two different groups. Explain how Omai might have benefited, and how he might have suffered, from his attempts to live in two worlds. Summarise in just one or two sentences why this item is a ‘treasure’ in our knowledge and understanding of aspects of Australian history.